Former Bristol duo Mitch Eadie and Jamal Ford-Robinson return to the Saints squad for Saturday's clash with the Bears at Franklin's Gardens (kick-off 2.45pm). 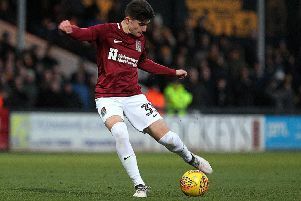 Game time has been limited for Eadie and Ford-Robinson since they left Ashton Gate for Northampton during the summer of 2017. But Eadie gets the nod at No.8 for this weekend's game, with Ford-Robinson, who was in action for Coventry in the Championship last Saturday, among the replacements. If the prop gets on, it will be his first league appearance for Saints for almost a year. He has played just once - as a replacement - in the black, green and gold this season, while Eadie will be making his first league start of the season this weekend. Tom Wood will skipper Saints from the No.6 shirt, while there are a couple of big injury boosts with the news James Grayson and Piers Francis are fit to start. Paul Hill is also in the first 15 after being forced off early in the defeat at Saracens last weekend, while Taqele Naiyaravoro is back after being rested. James Haskell (toe) and Fraser Dingwall, who had surgery on an ankle injury this week and is expected to be out for six to eight weeks, have been added to the absentees list. For Bristol, Jake Heenan will make his Gallagher Premiership debut this weekend. The back rower is the only change to the Bears side that overcame Gloucester last Friday. Callum Sheedy recovers from a dead leg to retain his place in the starting line-up, although Dan Thomas (head) is unavailable.